Ask anyone who has ever used WordPress, they would all agree that this CMS platform offers the easiest and the quickest ways to get your site up and running. But is it all you need to stay ahead in the game of having a complete & popular site for yourself? Off course not. You need to take care of web design, content management, marketing strategy and more but above all, you would require the right managed WordPress hosting to make sure your site is running smooth & trouble-free. Nowadays, it cost only a few dollars to get a good enough hosting service for your WordPress. But quality and reliable managed hosting are the ones you are looking for. So here we have featured (not in any preference order) some of the most reliable and widely used managed WordPress hosting. 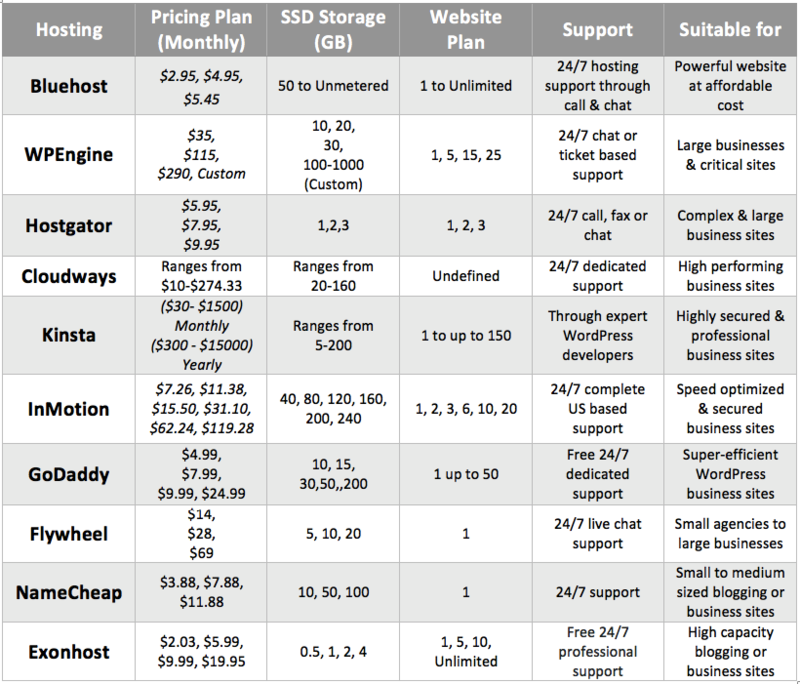 So let's get on with WordPress hosting comparison below. We are quite hopeful that by the time you are done with this post, you will be able to come to a conclusive decision on which managed hosting would suit you better for your WordPress or WooCommerce site. Your site is running slow and you need responsive support whenever any technical issue arises. Now you know when is the perfect time for you to turn towards a good managed WordPress hosting. But are you aware of the importance of having it? Let's find out. Blazing fast site: Having a fast loading site plays a vital role in getting your site to rank higher on Google and a good managed WordPress hosting helps you to do just that. All the renowned hosting company uses CDN, Caching plugins & reduces the image size on your site to boost the speed of your site. Full-proof security: With the constant security breach and hacking vulnerabilities of site's at its peak, this has become an essential demand for site owners. And you get a highly shielded layer of security for your WordPress site with all the professional managed hosting for WordPress. Professional customer support: You might need expert advice or instant support regarding your WordPress site's hosting services. And this is exactly what you get when you decide to have managed WordPress hosting. Regular backups & Automatic updates: Now you do not want to lose your daily content, themes, plugins or data due to any kind of mishaps. And you wouldn't want to miss out on the latest features either. With a premium standard managed WordPress hosting, you get to have daily backups of your site and regular automatic updates in the new version to keep you ahead in the game. Site is never down: It won't lay a very good impression on your visitors if your WordPress site keeps going offline or down due to not being able to handle the sudden frequency of traffic. But with a top notch WordPress managed hosting functioning on your site, it will never go down no matter how much traffic it gets. Here are ten of the top managed WordPress hosting not in any order of preferences. All of these are highly demanding managed hosting provider for WordPress and you will probably enjoy using all of them. This managed hosting is said to be recommended by WordPress.org, provides a hosting solution powerful enough to handle any kind of WordPress sites. You can enjoy its highly sophisticated web management tool, regular automatic update, and support from its highly professional expert support team. Get access to hundreds of themes that best suit your business and switch them in seconds to get started quicker. Not to mention of it being built in a WordPress staging environment to help you test the site before its public. Enable a unique experience of secured managed WordPress hosting at the most affordable cost. Our Verdict: Even though it handles the heavy load of almost all WordPress sites but there might be some dashboard issues to be resolved. The support is well-responsive and this managed hosting server is recommended & suitable for all types of professional WordPress sites. This one right here is one of the most renowned & oldest managed hosting providers for WordPress. The company has made a name for itself in the hosting industry by providing excellent support and secure servers. It provides hosting suitable for all your needs be it for shared, dedicated or cloud-based hosting. The company has some very highly skilled WordPress hosting professionals who are always there to keep your site up, secured & running. All its hosting plans come with endless useful features such as one-click restore and free hacking scans to fix the issue of the site. As a result of its growing infrastructure in the past, it might have gone through some rough patches but over time it has stabled itself and proved to be one of the most secure & reliable managed hosting for WordPress. Our Verdict: Although some add-ons option might get a little pricey but the security, reliability and customer support it provides, easily covers up for it. So if you are planning to set up a simple personal blogging site or a complex heavy traffic business site, WPEngine will fulfill all the requirement you need to set up a site of massive scalability and speed. It is said to be one of the cost-effective yet powerful managed hosting provider for WordPress. Due to its low-density servers, it claims to supercharge your page loading speed without needing to configure your caching or CDN. Efficiently manage any web content turning on its dynamic content management feature to process any request at a blazing fast speed. It's WordPress Cloud hosting speeds up your site's load time. Its utilities also include a one-click restore and backup feature. Fully equipped for sudden traffic spikes or any other increased scalability requirement. Get to have easier access to all the free email accounts and other useful hosting settings and files through a single portal. With hosting so secured yet its simple & user-friendly design gives you total control over your usage with the monitoring and allocation of useful additional resources with this web hosting platform. Our Verdict: Its additional domain can be quite pricey but considering the kind of features, security and functionality it provides at such a low cost makes up for it. So in case you are looking for a good managed hosting for your WordPress site at a budget cost, Hostgator can be the solution you might want to go for. Couldways commit itself to provide with the best cloud managed hosting for WordPress. The hosting is stacked with the latest technology offering the newest PHP versions, MYSQL as database and more. It has its in-built caching plugin Breeze that offers a seamless performance for the WordPress site at no extra cost. Improve the server response times with the CloudwaysCDN and effectively enhance the site’s performance. The servers are well protected by firewalls including encrypt SSL to ensure a extra layer of security for your WordPress site. It also consists of easy & automated backups. It has an extra security feature in the form of two factor authentication to keep your site safe from intruders. You to use its unique one click feature of cloning server & application. It hosts several WordPress staging areas enabling to test and develop the site without having to make changes to the live website. Enjoy the ease of migration from another server for free and make the best use of its hosting features on your WordPress site. Our Verdict: Even though, it might seem a little too technical for many. But this solution provides an extremely flexible and accessible solution for many. Mostly because it doesn't lock anyone with long term contract. So if you are running a small to medium sized business or even personal blogging then Cloudways can be the managed hosting you can turn to. This managed hosting for WordPress can be termed as a popular one among the users looking for a sophisticated managed WordPress hosting. This hosting has slowly made its way up the ladder proving itself to be a top quality managed hosting provider for WordPress. It is now mostly known for providing premium solution to large businesses. And the solution it provides is a highly optimized platform for most business company. With its fully managed features and latest technology of PHP 7, LXD, Ngnix, you get a WordPress server designed for super fast loading time. Hosting served with a highly secured network to help keep a check on your site against any possible threats online. Built with the mindset of next-generation infrastructure starting from server hardware to software it runs. The server is powered by Google Cloud Platform for seamless connections over the premium network. With its free migration facility, you will find it really easy to switch from another hosting to it. Our Verdict: Suitable for the users who want to keep easy scalability option open for their site. 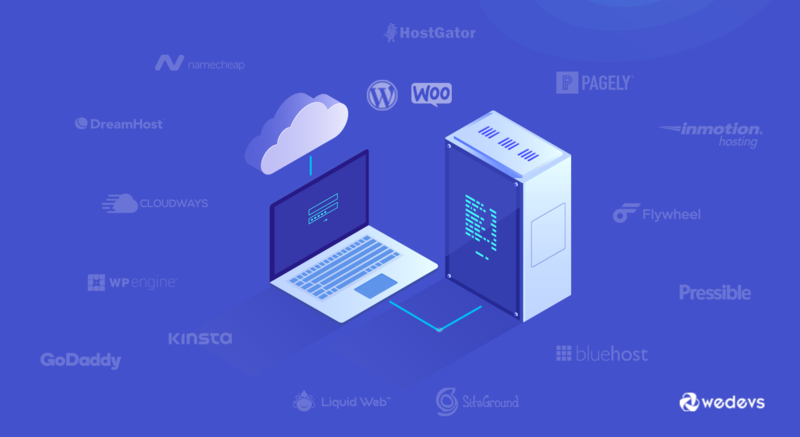 Even though some of its packages are quite pricey but if you are looking for a user-friendly yet powerful managed hosting for your WordPress then Kinsta is probably the hosting you would want to use. Known to be a secured and best in class hosting provider for WordPress, that comes with free SSD storage and CDN for speed optimized hosting. With its free migration feature now anyone can easily get started quicker. Get free automatic backup and keep your site protected from malware and hacking with hosting's premium options. Keep your server up to date with its automatic security patches. It has a number of premium plans loaded with features useful for every WordPress hosting. Using the BoldGrid included with all its pricing plans, anyone can build a stunning site in no time. Get online in minutes with its free installed WordPress and make the most of your site's hosting server. The server stack comes blazing fast to ensure ultimate performance. Easy to customize the content with the premium themes included and use any plugins available for WordPress with ease. Our Verdict: With a hack-preventing server and one-click installer option you can get a multi-functional and user-friendly experience in your hosting service. Also, if you need to use any plugins for WordPress or set up a customizable and cost-effective site then getting this managed hosting might be a good option for you. This is a hosting provider that is slowly making huge progress in the area of WordPress managed hosting. With the lightning-fast SSD based servers, anyone can set up and get started quicker. It handles all the technical stuff like account setup, automatic nightly backups, DDos protection, server optimization, 1-click restore and more with the utmost professionalism. Ensures the perfect performance with the platform built for WordPress optimized hosting. Your sites get easily found on the Google and other common search engines as it handles the SEO basics of your site with its SEO optimizations plugins. As a completely new user even if you don't have a domain, GoDaddy provides you with a temporary domain to create your site faster. The hosting serves with visitor overage protection. So that its user doesn't need to pay extra for additional visitors on their site. Get the most real staging environment to test your site before it is online. Continuous website security scan from this hosting neutralizes the malware that could prove to be dangerous to you and your customers. 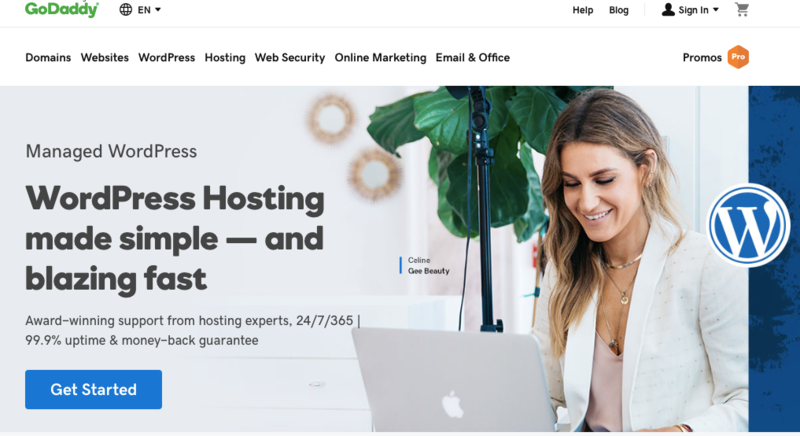 Our Verdict: For your personal and small business use, GoDaddy provides some really exclusive plans to host your WordPress websites. So if you are looking for a managed hosting for your simple blogging or even a feature-rich website, then GoDaddy can present you with some awesome hosting solution. This one is relatively new in the field of WordPress managed hosting compare to others in the list. Mostly known for its user-friendly interface and ease of use, the hosting provider currently comes with its built-in caching system and automatic backups. All its plan comes with 24/7 live chat support and free SSL. Recently the hosting has come up with some inexpensive plans for users wanting to get started with managed hosting. This hosting has quickly made a mark for itself in the sector of managed hosting for WordPress. And the platform it holds is built with creatives and designers in mind. Moreover, the intuitive SFTP enables collaborating with designers easier than ever. It helps to reduce the page loading time. And also encourages easy scalability and the ability to use any WordPress plugins you want are some of the key attributes that make this hosting stand out. More importantly the highly qualified WordPress experts it hired to resolve any issues that may transpire to their users. Our Verdict: Even though the additional server features can be a little on the expensive side but the performance it serves can cover up for it especially for users looking for a user-friendly and fast hosting service provider for their WordPress site. So it is most suitable for users who like to manage, customize and scale up their site with ease. Naming the plans for WordPress hosting as EasyWP, it vows itself as the managed hosting platform for every WordPress users. Simply create and manage your site on EasyWP with its easy to use managed WordPress hosting options. First of all, the pricing plans are not only cheap, but it is also packed with the latest technology of cloud hosting and totally optimized for WordPress platform. The infrastructure developed for WordPress managed hosting allows the sites to grom with any hassle. With the promise of risk-free investment and 99% uptime guarantee you can enjoy a true experience of managed WordPress hosting without any hiccups. Moreover, its next-generation technology enables your site to grow easily. That too with heavy traffic rate all the time. It consists of a powerful hosting tool that updates on a regular basis. A maintenance mode option is there for every site to decide for its user to go live whenever they are ready. More importantly, with a single login, a user gets to manage and update all settings from the one dashboard. Get quite an easy accessibility to your files through SFTP for safe sharing of credentials. Our Verdict: Just like its name, it provides hosting plans at a very cheap price. Being cheaper in price doesn't always mean its low in quality and this goes for Namecheap. Although it comes with some really reasonable pricing plan. But it doesn't lack much in the powerfulness managed hosting. So, if you are looking to host your WordPress sites with an inexpensive yet compelling hosting solution then this is the service you can turn to. This hosting service provider might look like a small name in front of some of the giants in the WordPress hosting industry listed above. But in terms of functionality and quality of service, it doesn't quite lag behind. It promises its user to provide a full proof hosting service conducted by features suits most business websites in WordPress. For day & night operation of your site, it provides you the best in-house 24/7 customer support. Moreover, you get to transfer your site from another platform absolutely free. Not just that, its hosting plans come with a free domain name for the first year. Enjoy the advantage of setting up your site instantly without needing to waste any time. Install all the necessary plugins with just a single click and get your WordPress site ready in no time. With all its advanced & updated features always stay ahead experiencing the smart way of hosting your WordPress site. 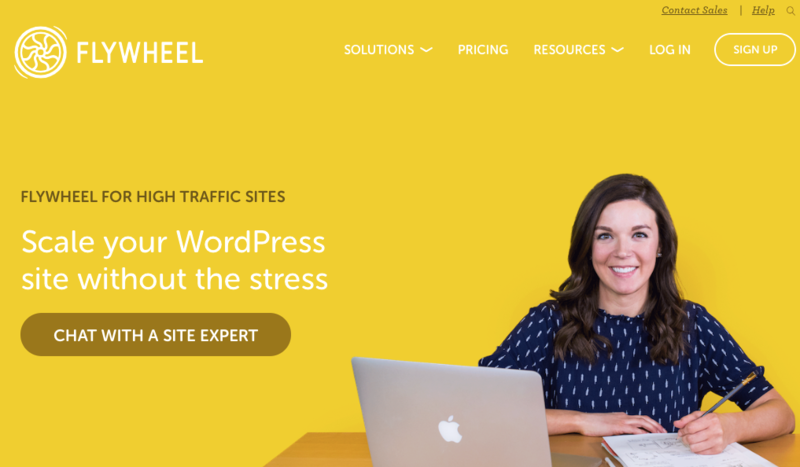 Our Verdict: Even though it is considered new in the managed hosting market, but it comes with some exciting and affordable pricing plans to manage host your WordPress site. It beholds features and benefits that would suit most small business sites and if you are looking to host one then Exonhost will probably won't disappoint you. 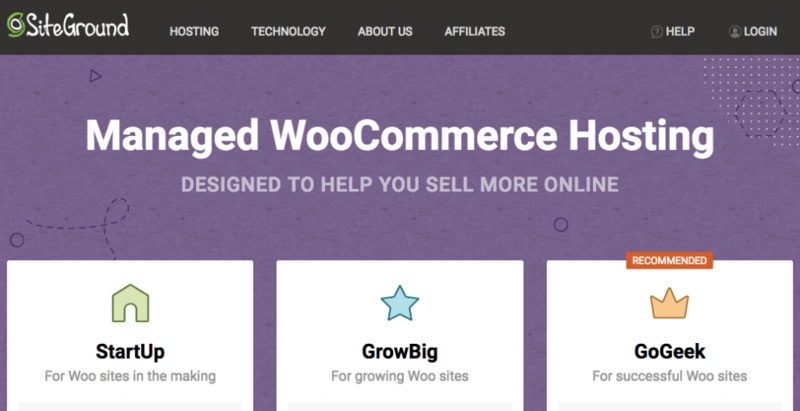 In WordPress, WooCommerce site is something you can never afford to ignore. WooCommerce is the most popular platform in WordPress when it comes to building your online e-commerce store. And you would need a highly capable managed hosting to handle such sites. So here are some of the managed hosting providers that provide WooCommerce optimized hosting. Presents its users with a highly optimized hosting service that dedicates its premium features to be unleashed for WooCommerce. You get one of the best in hand e-commerce supported web hosting. Also, get a complete custom feel provided with the popular page builder Beaver Builder. Get to add unlimited products and order. It comes with a solid site backup facility, customer support, security and more. You can also integrate your WooCoommerce with a powerful multi-vendor marketplace solution like Dokan and become a proud marketplace owner yourself experiencing a super fast hosting server experience from LiquidWeb. This is a WooCommerce optimized hosting provider specialized in personalized onboarding service. It provides free migration and unlimited storage to its users. You can enjoy the facility of accessing an enterprise architecture plan for each of your WooCommerce store. More importantly, the hosting comes with Jilt email marketing and free premium Jetpack feature. It highlights of having a super quick customer support team that can be termed as one of the main USP for this hosting. 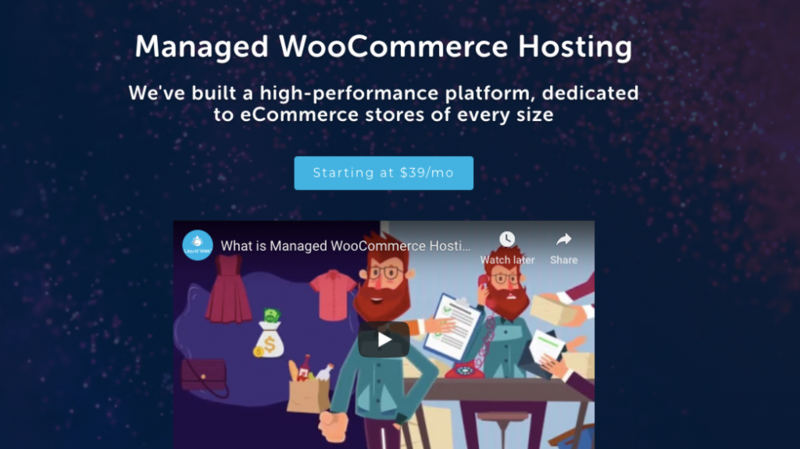 So, even if you are looking to manage host your multi-vendor marketplace with WooCommerce, your site would experience a fully optimized web hosting from it. Quite a popular name in the business of web hosting and made huge progress providing WooCommerce optimized hosting. It presents its users almost every kind of hosting services starting from shared hosting to cloud hosting services. Moreover, not to mention its managed WordPress hosting that people can get. Lastly, anyone needing to get a reliable web hosting at a cheaper price mostly turns towards it. The hosting provides its user with top class security features. For fast loading of sites from anywhere in the world, it has the free Cloudflare CDN system. The hosting is built under SSD servers with PHP 7 and Opcache making it one of the ultra-fast server platform for WooCommerce. The hosting features attached to the plan of Pagely is something that most suits the big businesses. Having its name made for being a developer-friendly hosting, it has also made quite a mark being one of the fastest managed hosting for WordPress & WooCommerce sites. Besides that, the server also emphasis on high-level of security and is currently using the Amazon's server allowing them access to several advanced features of it. And it improves the loading time of your websites and more importantly focuses on the WordPress security configuration to keep the site safe from any server-related security threats. Even though the plans are mostly on the expensive side, but for businesses big enough like for any WooCommerce or a multi-vendor e-commerce site, it provides one of the better solutions anyone can ask for. It publicizes itself to be the most efficient hosting server for eCommerce platform and rightly so. Optimized for WooCommerce sites, Dreamhost provides plans specially designed for the WooCommerce site owners with higher traffic and storage requirements. Widely popular for its unlimited bandwidth facility and its fast, secured and optimized for WooCommerce advanced settings. Moreover, along with some basic plans, it has some feature rich premium plans architectured. Especially for WooCommerce or multi-vendor marketplace for WordPress that demands high capacitive performance and extreme functionalities. More importantly, once you chose your desired plan for your WooCommerce site, it has a very easy setup & installation process making it one of the easy-to-use managed WordPress hosting service provider out there. After reading the article, are you already getting in the dilemma of being able to pick the right hosting provider for WordPress? Well, you probably are. Also, it is quite understandable as all the above mentioned managed WordPress hosting has its own qualities and features that are enough to confuse the new users. But we are confident, at least we were able to make the task easier for you through this WordPress hosting comparison. Even for us, it wasn't easy to single out any particular hosting providers to recommend for you. As every managed WordPress hosting that we have talked about hold immense abilities. Also, it can outperform one another in several entities that each one of it is good at. That's why these hosting service providers can only be termed as some of the top ones out of the hundreds and thousands out there in the market. We know that your choice of getting your managed hosting will depend on the kind of site you need to host. Therefore, we have categorized the hosting providers in this article into two parts. One for general WordPress sites and the other one for sites that want to sell products online like in WooCommerce. So if you have a small WordPress website, then you may want to stay on shared hosting until it is actually big enough to get the expensive & well-secured advanced managed hosting ones. And at the end of the day, it again depends on your site's demands as they all apply to many other considerations like features, pricing, scalability, customer support of the hosting service provider etc. Lastly, have you been using any of the above mentioned managed WordPress hosting? Then, we would love to hear your experience with it in the comments section below. Also, you may add any thoughts regarding the comparison we did here.